NETWORK FINALS: FOX’s telecast of the PAC-12 Championship COLLEGE FOOTBALL game was adjusted to 1.7. 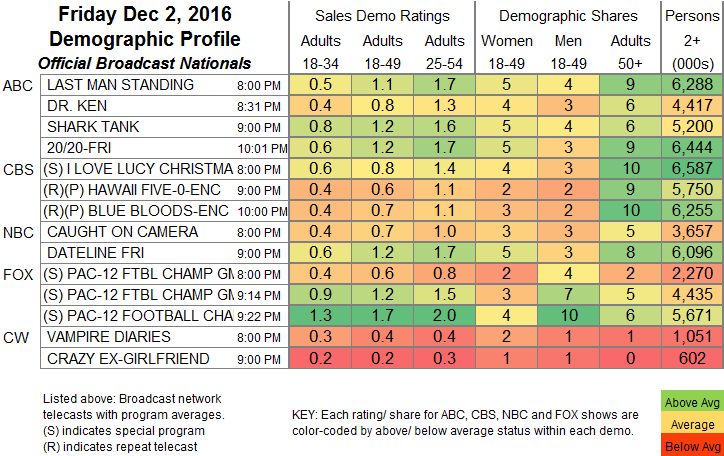 In addition, 20/20 gained 0.1 in final numbers, while CRAZY EX-GIRLFRIEND, the I LOVE LUCY CHRISTMAS SPECIAL and DR KEN all lost the same. CABLE HIGHLIGHTS: (NOTE that comparisons are to a mix of last week and 2 weeks ago, since several networks didn’t air original programming on the night after Thanksgiving.) Discovery’s GOLD RUSH once again led Friday cable, up 0.06 to 0.97, with lead-out TREASURE QUEST up 0.05 to 0.45. ESPN’s NBA doubleheader had the #2-3 slots, with Cleveland vs. Chicago at 0.69, and Houston vs. Denver at 0.50. A trio of late-night Adult Swim shows hit the Top 10, with MR NEIGHBORS HOUSE at 0.50, HINDENBURG EXPLODES at 0.41, and MARK LEMBECK TECHNIQUE at 0.36. Nickelodeon’s noon PAW PATROL was also Top 10 material at 0.41. Food Network’s DINERS, DRIVE-INS & DIVES was steady at 0.35. ESPN2’s Western Michigan vs. Ohio COLLEGE FOOTBALL game was at 0.31. On HGTV, HOUSE HUNTERS INTL fell 0.09 to 0.27, and HOUSE HUNTERS was down 0.08 to 0.24. 3 hours of LIVE PD on A&E were down a tick to 0.26. Spike’s BELLATOR LIVE was at 0.23. On We, MARRIAGE BOOT CAMP dropped 0.04 to 0.22, and MY LIFE IS A TELENOVELA ticked down to 0.05. Syfy’s Z NATION fell 0.08 to 0.21, and VAN HELSING was down 0.03 to 0.12. 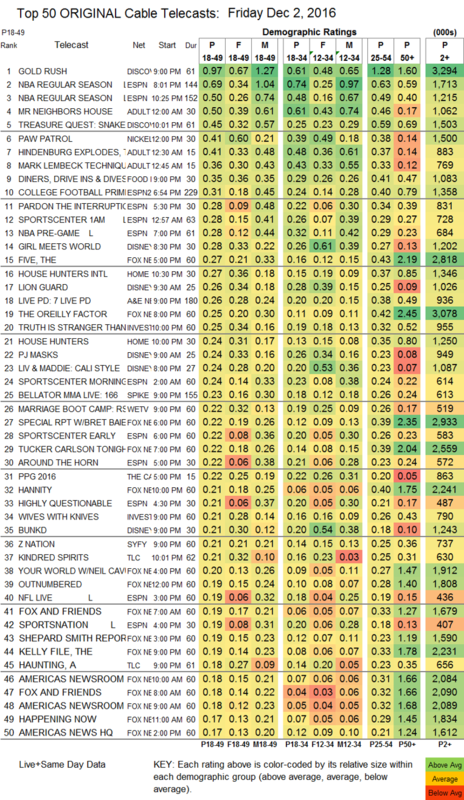 On TLC, KINDRED SPIRITS gained 0.06 to 0.21, and A HAUNTING was up 0.05 to 0.18. HBO’s TRACY ULLMAN’S SHOW held at 0.06. On IFC, the 2 episodes of COMEDY BANG BANG were at 0.02/76K and 0.02/66K, below the 0.04/0.03 from 2 weeks ago.